I’ve been monitoring the availability of a 20 medal set titled: The Voyages of Captain James Cook. This is a Franklin Mint issued set that was only offered in Australia. That is right. Solely in Australia. #1 Departure from Plymouth in 1768. #2 Landfall at Tierra del Fuego 1769. #3 Arriving at Matavai Bay Tahiti in 1769. #4 Nick Young sighting the coast of NZ in 1769. #5 Landing at Botany Bay in 1770. #6 Endeavour strikes the Great Barrier Reef in 1770. #7 Cook takes possession of NSW in 1970. #8 Received at Court by King George III in 1771. #9 The resolution and the Endeavour cross the Antarctic circle in 1773. #10 Astronomical observations at Dusky Bay NZ in 1773. #11 Cook takes on board Omai and Odiddy in 1773. #12 Cook visits Easter Island in 1774. #13 Landing at Erromanga, New Hebrides in 1774. #14 Cook sits for portrait by Nathaniel Dance in 1776. #15 Repairing the Resolution at Van Diemans Land in 1777. #16 Last idyll in the Pacific in 1778. #17 Exploration of Nootka Sound in 1778. #18 Cook reaches Siberia in 1778. #19 Search for North West Passage in 1778. #20 Death of Cook in 1779. 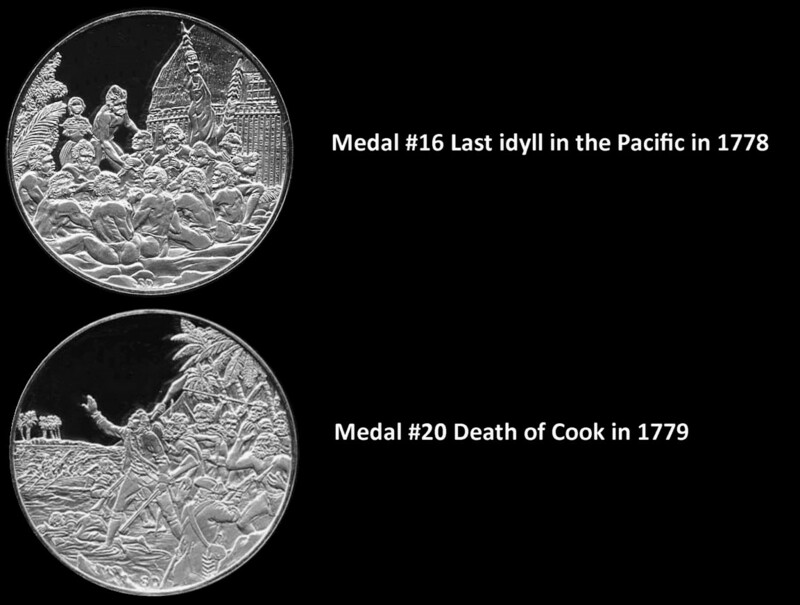 Medal #16 and #20 are significant specimens for Hawaiian collectors as they depict Captain Cook and Hawaiians. Technically these are Franklin Mint issues (Medcalf & Russell lists several Franklin Mint issues). As such, these two medals will be included in the guidebook I’m writing. These two medals (and the set) are not generally known to exist by the Hawaiian collector. As a Franklin Mint specialist for items relating to Hawaii, this is the first public documentation about the set and medals directed toward the Hawaii collector. During the past year I seen 4 sets sold in Australia (auction house and auction websites). I’ve seen 3 sets listed on ebay (1 was re-listed twice). The cost of the set to cannibalize 2 medals was not worth the price as the remaining 18 would be a bear to resale in the US. However, a dealer in New Zealand recently listed all 20 24 KT gold plated on sterling medals individually. I picked up medals #16 and #20 at a reasonable price plus shipping. I’m still in the process of studying this medal series (i.e. there is an “S” on the bottom of the reverse. Does it stand for Sydney?). The Franklin Mint hallmarks are normally on the rim. Click to isolate the image. Click again to enlarge.